U.S. Sen. Kamala Harris (D-CA) speaks during a town hall meeting at Canyon Springs High School on March 1, 2019 in North Las Vegas, Nevada. 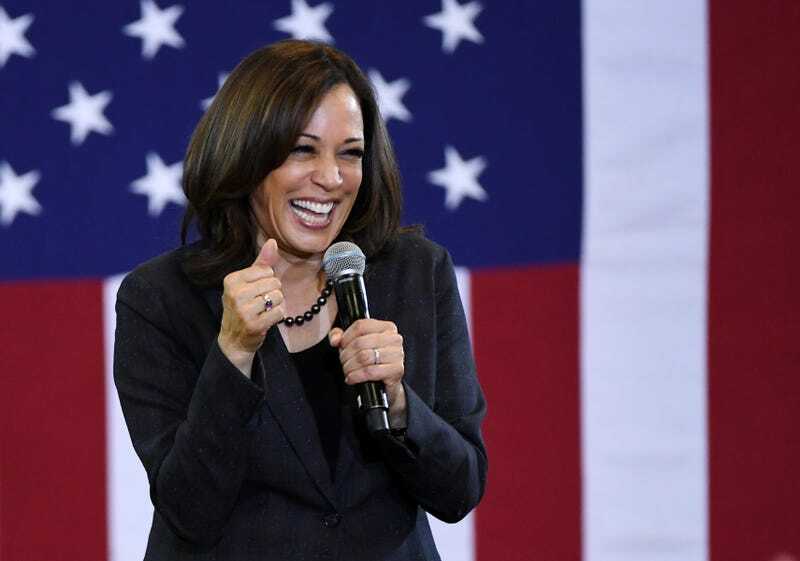 Harris is campaigning for the 2020 Democratic nomination for president. This weekend, guess which Democratic presidential candidate became one of the first to throw a major public campaign event in metro Atlanta? If you guessed U.S. Sen. Kamala Harris (headlines can be misleading), you’d be correct—as the former attorney who could one day run our country brought her infectious energy to both Ebenezer Baptist Church and Morehouse College. According to the Atlanta Journal-Constitution, the fun began with Rev. Martin Luther King Jr.’s former stomping grounds—Ebenezer Baptist Church. Upon the conclusion of her remarks, Harris received a standing ovation from those in attendance. While prior to leaving, she was swarmed by ardent supporters who clamored for selfies and showered her with unbridled praise. Her next stop was Morehouse, where she enjoyed an elaborate introduction that included a who’s who of local legislators. At Morehouse’s Forbes Arena-McAfee Court, all three scoreboards had 20-20 scores glowing in neon to note the year of the presidential election ahead. After enthusiastic introductions from local politicians and officials including U.S. Rep. Hank Johnson, former congressional candidate Jon Ossoff and Gwinnett County Board of Education member Everton Blair, Harris took the stage with a hearty “What’s up, Atlanta?” She was greeted by the crowd of about 3,000 with applause, cheers and stomps. Her speech hinged on the concepts of justice and “speaking truth” — being honest even if the truth is uncomfortable. At both the Morehouse rally and the Ebenezer church service, she addressed issues of gun violence in schools, gun control and police violence in communities of color. But how well were her messages received? Also during her trip, Harris received an endorsement from Democratic State Rep. Erick Allen—her first from an elected Georgia official.